302 × 192 mm. – 410 leaves with 51 woodcut illustrations in contemporary colouring highlighted with gold. “Heinrichstadt” (Wolfenbüttel): Konrad Horn, 1576-1577. 302 x 192 mm. 410 leaves. 51 woodcut illustrations. Full title: Corpus Doctrinae, das ist Die Summa, Form und fuerbilde der reinen Christlichen Lehre, aus der heiligen Goettlichen Schrifft der Propheten und Aposteln zusammen gezogen. – First edition in Latin, edited by Martin Chemnitz, in a magnificent, colourful 'princely' binding crafted for Duke Julius of Braunschweig-Lüneburg at Wolfenbüttel by the court bookbinder Lukas Weischner. This ‘body of doctrine’ is a collection of texts that was meant to summarize the teaching and doctrine of a confession. The present Corpus doctrinae was compiled and edited by Martin Chemnitz (1522-1586) by order of Duke Julius of Braunschweig-Lüneburg, prince of Wolfenbüttel (1528-1589). Chemnitz, one of the most important second-generation Lutheran theologians and reformers, was ecclesiastical superintendent for the duchy of Braunschweig-Wolfenbüttel and under his leadership the duchy was brought firmly in to Lutheranism. A woodcut portrait of Duke Julius serves as an introduction. To clarify the theological topics, Luther’s catechism is furnished with large woodcuts, placed at the beginning of the instructions. All illustrations are skilfully coloured and washed by a contemporary hand. 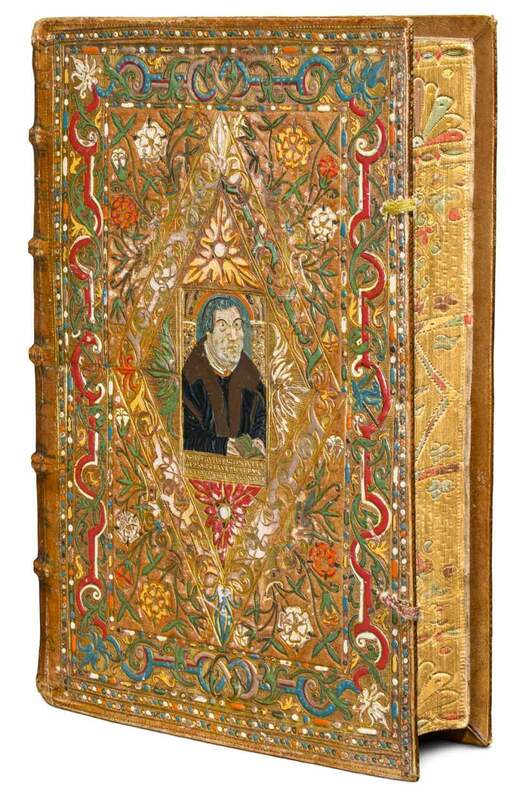 The magnificent colourful ‘princely’ binding was crafted for Duke Julius at Wolfenbüttel by his court bookbinder Lukas Weischner (1550-1609). A portrait of Luther is on the upper cover and the duke’s coat of arms on the lower cover. The gilt edges, moreover, are also elaborately tooled (gauffered) and painted, including a crucifix on the fore-edge. This work is now in the collection of the Deutsches Historisches Museum in Berlin.